YourNurseIsOn.com CFO Phoebe Browning has been honored as a finalist in the Connecticut Technology Council's 2010 "Women of Innovation" awards. As a founding member of YourNurseIsOn.com, Mrs. Browning's leadership, team building skills, financial acumen and vision have been instrumental to the incredible success of YourNurseIsOn.com . Congratulations! -Phoebe Browning, on an honor well deserved! 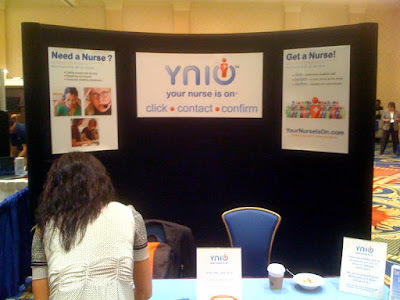 2010 is shaping up to be a GREAT YEAR for YourNurseIsOn.com !! YourNurseIsOn.com is Nationwide!! 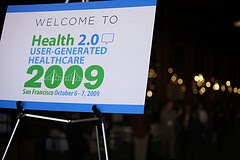 Now sponsoring HealthCampNYC on Nov 7, 2009 at Columbia!! OK- These HealthCamp folks have got it figured out! Put a bunch of innovative Health 2.0 types into a room and ask them what they have to share- Sounds simple? Constructively Chaotic maybe? We had so much fun at this HealthCamp that we have to do it again!! YourNurseIsOn.com is sponsoring HealthCamp NYC and we will be blogging on it soon!! YourNurseIsOn.com had an excellent time at the 2009 Planetree Annual Conference in Maryland and we would like to thank Lisa Donnarumma and her wonderful team at Planetree for inviting us and for being such wonderful hosts. The Marriott Waterfront in Baltimore, Md is a beautiful location and the conference attendees were from around the world and committed to patient-centered care. The interest in instant, collaborative, 2-way communications between hospitals and their providers and staff was pronounced and nearly universal. YourNurseIsOn.com was glad to be there to answer questions, conduct numerous demonstrations and to present "Staff Communications 3.0" on the final day. YourNurseIsOn.com had three winners of $5,000 dollars each that will be announced this week!! A BIG THANKS to Melanie and Derek for all of their hard work!! YourNurseIsOn.com had a great time today at the Worcester Polytechnic Institute today as a presenter in their business plan competition- it was an amazing location and our hosts were wonderful. What do Masonicare, Qualidigm and CANPFA All Have In Common?? They All Heard About YourNurseIsOn.com and INSTANT Staff Communications TODAY!! It is truly wonderful to be at the "Ban The Bug (pdf)" Continuation Of Operations Planning (COOP) seminar TODAY (right now :-) presented by Qualidigm and our friends at the Connecticut Association of Not-for-profit Providers for the Aging (CANPFA) and hosted by Masonicare . YourNurseIsOn.com is happy to share our incredible 2-way, instant staff communications platform with these wonderful organizations and grateful for the opportunity. All miked up and ready to go! WOW!! YourNurseIsOn.com rang phone in under 15 seconds LIVE ON STAGE!! Could've called 50 nurses just as fast and confirmed one!! Where did we get "Those AMAZING Graphics" we had at Planetree?? "Where did you get those AMAZING graphics?" Our wonderful team at Independent Software did the wonderful design work! 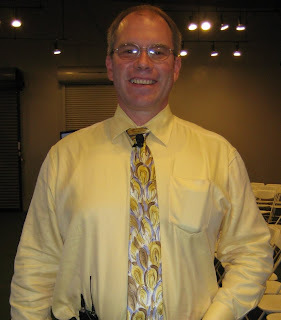 And our Conference Display Maestro - Dave Graham- from Blazer Graphics did the printing, provided a rental popup background, handled shipping for us to the event and smiled the WHOLE TIME :-) - along with his EXCELLENT TEAM!! So there is your answer- for our "AMAZING Graphics" we used Blazer Graphics and good design! 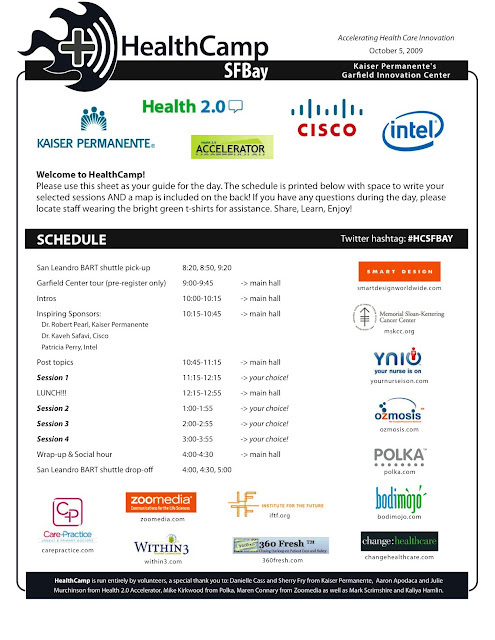 HealthCamp SFBay was a HUGE success!! YNIO was glad to be part of it! HealthCamp SFBay was held this week at Kaiser Permanente's Garfield Innovation Center in San Leandro, CA. WOW! What an incredible facility! 35,000 sq ft of innovation location- full clinical work-study stations that can be rearranged in minutes to study the effects of work environment on efficiency, safetey and patient experience and outcomes. GENIUS!! Kudos to KP and their forward thinking innovators! The HealthCamp itself was a wonderfully eclectic mix of E-Patients, Healthcare aficionados, care product innovators and industry types all coming together to explore new ideas in healthcare and to revisit some old assumptions. The blend of Kaiser Permanente and the Health 2.0 accelerator as sponsors was a refreshing blend of visionaries and practitioners in the same room- on the same page. A big thanks to Dr. Yan Chow and his amazing team at Kaiser for hosting us and a big round of applause for Julie Murchinson of the Health 2.0 Accelerator for organizing another successful HealthCamp. Julie's team was incredible and a big thanks to all who helped run the show!! Go Green Shirts!! YourNurseIsOn.com was pleased and proud to sponsor such an important event and will cherish our new friends and ways of thinking. 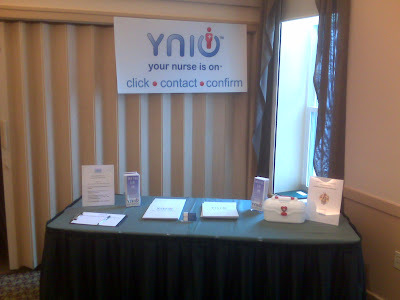 YourNurseIsOn.com is at the 2009 Annual Planetree Conference TODAY thru WED 10/7/09- Here is our booth photo!! The team has made the trek to Baltimore, Maryland as a sponsor of the 2009 Planetree Annual Conference in Baltimore, MD for 10/5/09 until 10/7/09. Stop by and see us!! Remember to ask about our special Planetree Conference Discount!! YourNurseIson.com + Planetree + "Patient-centered care month" + The VA = ????? A Blog post form an airplane at 30,000 feet!! YourNurseIsOn.com is happy to celebrate "Patient-centered Care Month" with our good friends from Planetree and The Veteran's Administration at the 2009 Planetree Annual Conference!! 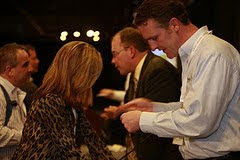 If attending the 2009 Planetree Annual Conference visit our booth and ask about our special Planetree discount!! Click. Contact. Confirm. Healthcare Providers in seconds!! Many of our clients have expressed concern about how to contact their staff with important information or to fill mass illness-related callouts during this disconcerting flu season. How do you notify 1000 employees that there are known cases of "Swine Flu" in your facility, warn pregnant women to stay away, or request all personnel bring their protective equipment ?? YourNurseIsOn.com can notify ALL OF THEM in minutes and require a confirmation response, if needed, for your compliance records. Calling healthcare staff, one at a time, by telephone, is NOT an efficient way to handle your hospital or healthcare facility's communications any longer. YourNurseIsOn.com - Click. Contact. Confirm. As seen on Fox 61 News, Hartford, CT HERE! Watch YourNurseIsOn.com on Fox 61 News in Hartford, CT- Right Here! Right Now!! A BIG THANKS!! to Rick Hancock for doing a GREAT JOB!! YourNurseIsOn.com will be on Fox News Channel 61 in Hartford, CT on Friday 9/25/09 at 1030pm give or take a few minutes! "We are excited to spread the message of YourNurseIsOn.com to the people and healthcare providers of Connecticut. In these times of healthcare turbulence it is gratifying to be able to save hospitals and healthcare facilities time and money in contacting and confirming their staff," states CEO Matthew Browning. "We would also like to thank Rick Hancock for his devotion to technology reporting and his showcase 'Rick's RSS' television show for interviewing us." So watch Fox 61 Hartford this Friday evening at approx 1030pm and share your thoughts with us!! (Connecticut Association of Not-for-Profit Providers for the Aging) Berlin, CT headquarters on September 24, 2009. YourNurseIsOn.com sales manager Jon Sullivan will be discussing staff communications technologies that can save healthcare facilities time and money. We look forward to the breakfast at CANPFA on September 24, 2009!! This event has been postponed until 9/24/09- Thank You!! YourNurseIsOn.com CEO Matthew Browning MSN, RN will be a keynote speaker at Yale University's School of Nursing's 2009 Reunion Weekend. 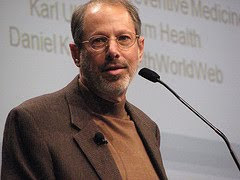 Speaking on "Ideas Into Action: New Visions From Yale Nurses," Mr. Browning will be speaking along with Tara Walsh Malbasa , founder of the Sibling Outreach Program at The Cleveland Clinic, and Brian Geyser, founder of CareNetworks.com . Mr. Browning will be discussing changes in healthcare staff communications technologies and how these technologies can be harnessed by hospitals and healthcare facilities to realize better patient outcomes, increased staff morale, decreased overtime costs and improved operational efficiencies. Browning will also focus on how nurse entrepreneurs are changing the face of healthcare and explore the myriad opportunities for change available to aspiring business professionals. (Connecticut Association of Not-for-Profit Providers for the Aging) Berlin, CT headquarters on September 16, 2009. YourNurseIsOn.com sales manager Jon Sullivan will be discussing staff communications technologies that can save healthcare facilities time and money. We look forward to the luncheon at CANPFA on September 16, 2009!! YourNurseIsOn.com To Co-Sponsor HealthCamp SFBay with Kaiser Permanente and The Health 2.0 Accelerator on October 5, 2009 !!!! YourNurseIsOn.com is proud to announce that they are co-sponsoring the HealthCamp SFBay "unconference" with Kaiser Permanente and The Health 2.0 Accelerator on October 5, 2009! We are pleased to gather with such a wonderful group of healthcare innovators and leaders to discuss healthcare and technology in a freely structured setting. Many changes are on the horizon for healthcare and YourNurseIsOn.com is excited to be a part of them. We look forward to seeing you there! Sorry but YourNurseIsOn.com will NOT be presenting at the Connecticut Technology Council- New Haven's Health 2.0 meeting on September 10, 2009. Griffin Hospital has done it again! They have placed 8th in the "Top 100 Companies to Work For" award from Fortune Magazine. YourNurseIsOn.com thanks them for their patient-centered care, their respect for their employees and their embrace of technological innovation that keeps them ahead of the pack! 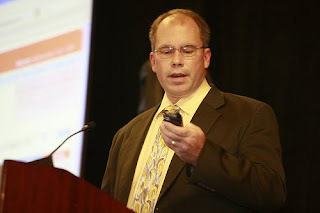 Continuing our streak of high profile speaking engagements and recognition as a game changing healthcare staff communications technology company, YourNurseIsOn.com is both sponsoring and presenting at the 2009 Planetree Annual Conference. YourNurseisOn.com is the leader in efficient healthcare staff communications saving hospitals and healthcare facilities thousands of hours and millions of dollars by contacting and confirming their staff in seconds instead of hours. YourNurseIsOn.com CEO Matthew Browning, MSN, RN, stated " YourNurseIsOn.com is committed to helping Planetree hospitals continue to innovate and adopt technologies that increase employee satisfaction, improve patient outcomes and that result in increased efficiencies and cost savings. The adoption of real-time, interactive, collaborative staff communications systems such as YourNurseisOn.com can help Planetree Healthcare Organizations do all of this and more. We are excited to sponsor this 2009 Planetree Annual Conference and to work with such forward thinking healthcare leaders." All attendees at our "Staff Communications 3.0 - Maximizing Outcomes, Efficiencies and Savings for Planetree Facilities" will be entered to win one of three $5,000 gift certificates to be given away during the conference!!! YourNurseIsOn.com Demonstration at The Health 2.0 Conference in San Francisco on Oct 6, 2009!! YourNurseIsOn.com will be demonstrating their revolutionary staffing communications software service at the 2009 Health 2.0 Conference being held in San Francisco this October 6, 2009 at 3:40 pm. During the breakout session "Health 2.0 Tools for Administrative Efficiency," YourNurseisOn.com will exhibit their patent-pending technology that saves hospitals and healthcare facilities thousands of hours and millions of dollars. YourNurseIsOn.com CEO Matthew Browning said of the event "Matthew Holt, Indu Subaiya and their Health 2.0 conferences are bringing innovative technologies in healthcare to the forefront of public discussion and all of us at YourNurseisOn.com are excited to be part of bringing these changes to modern healthcare." Targeted Instant Communications, Inc. (Parent Company of YourNurseIsOn.com) has been Designated a "2009 Company to Watch" by the CT Tech Council. TIC, Inc. is a finalist for 2 awards during their Cantor Colburn Innovation Pipeline Awards ceremony on September 17, 2009. Tic, Inc. will also be presenting a company poster and an elevator pitch during the evening's competition. 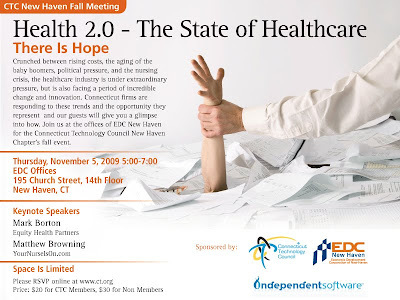 YourNurseIsOn.com CEO Matthew Browning will be speaking on trends in Health 2.0 at the New Haven chapter of the Connecticut Technology Council on September 10th, 2009. YourNurseIsOn.com is helping hospitals, nursing facilities and agencies realize increased efficiencies and cost savings when contacting and confirming their health care staff. YourNurseIsOn.com is excited to work with the Connecticut Technology Council to share innovative healthcare technologies with its members.